Just Genesis : Did Jesus Have a Wife? Did Jesus Have a Wife? 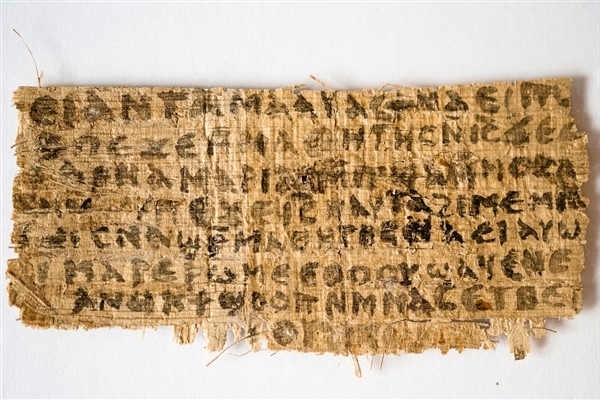 Karen L. King, the Hollis Professor of Divinity at Harvard University, notes that Jesus refers to a wife in this Gnostic Coptic fragment. The specific phrase in question reads, "Jesus said to them, 'My wife..." and many assume that this must be a literal wife. In this article in the New York Times, King makes the point "that this fragment should not be taken as proof that Jesus, the historical person, was actually married. The text was probably written centuries after Jesus lived, and all other early, historically reliable Christian literature is silent on the question." The Vatican has declared the fragment a fake. The fragment represents Coptic Gnosticism or late Egyptian mysticism. Mysticism of the Nile Valley often involves allegories about taking a wife. The ruler's second wife was taken at the time of the ruler's ascension to the throne, so the metaphor of a wedding is linked to the beginning of the kingdom. Jesus might naturally use such language in referring to his ascension and the dawning of His eternal Kingdom. Jesus Christ never married but He has two brides, following the marriage and ascendancy pattern of his Horite ruler-priest ancestors. A second bride was taken shortly before he ascended. The second bride is the Church, represented by Photini. As was the common practice among Abraham's people, grooms met and courted their brides at wells. The pattern of two wives characterizes the Horite marriage and ascendency structure. This is evident with Abraham's father, Abraham, Jacob, Esau and Moses' father. The first wife is his sister bride, represented by all who lived in faithful expectation of His coming into the world in the flesh. They repose in the "Bosom of Abraham." Among these are the priest Simeon and the Prophetess Anna. Was Abraham an Idol Worshiper?